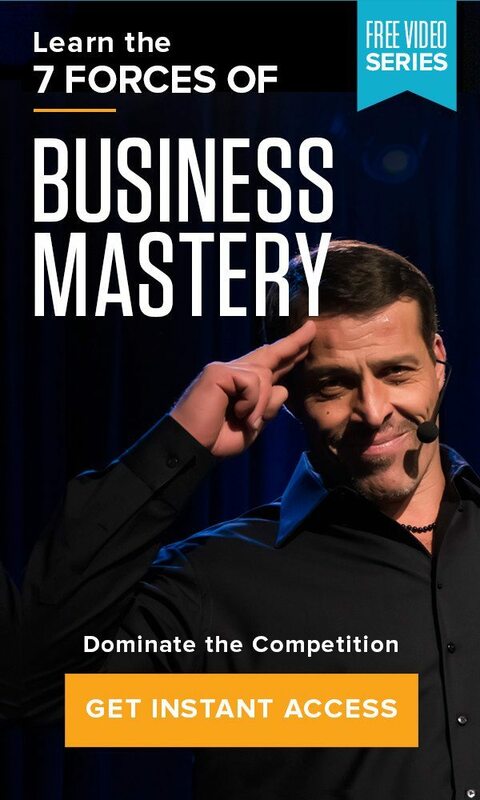 Home » The Tony Robbins Blog » Career & Business » What is business mapping? Industries change so quickly, thanks to the constant development of technology, that a business plan is no longer enough to plot the future of your business with any certainty. Disruptive technologies or unexpected competitors can come along and displace your business overnight. How do you position your business in this hyper-competitive environment? Are you wondering how to make a business plan that will lead you in the right direction? Do you know how to write a business plan that will turn your worries into wins? That’s right. You need to stop focusing on how to set up a business plan and instead focus on creating a business map. What is business mapping, and how does it differ from a traditional business plan? The process of business mapping goes deeper than a business plan. Not only does it address growth possibilities, sales and other surface issues, but it delves into what your business does, who’s responsible for what and what standards should be held to determine success. The goal of a business map is the same as a business plan: to be more effective. However, it takes a more holistic approach to get there. Your first answer will probably be the obvious one. You’re in the business of developing software or construction. With a business map, however, your answer doesn’t stop there. You have to drill a little deeper. For instance, what business is Starbucks in? Most people would say the coffee business. But ask Starbucks CEO Howard Schultz, and he will likely tell you about his trip to Italy, where he saw people eagerly meeting in cafes before and after work. Before Schultz ever began wondering how to create a business plan or map, he saw the promise of a transitional meeting place between home and work, and that was the seed that grew into Starbucks. He knew his business was about creating an experience, not just delivering coffee. What experience do you create with your business? Is it about the products or service or is it about something bigger? When you discover and harness your purpose – both as an individual and a business – you can truly realize your vision. How is this useful? These questions prompt business owners to think not only about their specific company, but the industry as a whole and the people they’re delivering value to. Back in the early 1900s, if railroad companies in the U.S. realized that they were really in the transportation business, not the railroad business, they could have prevented the entire industry from going bankrupt as the trucking industry took over. Having a business map really means framing your business in terms that enable you to see opportunities (and threats) that you might otherwise overlook. Knowing what business you’re really in means having a deep and thorough understanding of your customer and the value they gain from you. This allows you to consistently provide more value to your customers and clients than your competitors do through innovation. Once you really understand how to consistently offer more value than anyone else in your market, you’re in a better position to identify where you are now, and what it will take to get to where you want to be. Connecting values and purpose to your business map will not only help you grow and create a better experience for your customers, but it will also ensure that you, your partners and your team members will be happy in the workplace. As every good leader knows, their business simply can’t succeed unless they have an engaged team that is deeply connected to their cause. If you want to increase engagement in your business for yourself and for those you lead, take the next step in personal development by attending Unleash the Power Within, a powerful 3 ½ day, in-person experience that will improve all areas of your life. When you create a business map rather than a business plan, you’re digging deeply into your business to find out what really makes it tick. This will help you create a better experience for your customers, your team members and you. You’ll have more certainty about what your business needs to grow now, and you’ll be better able to steer your organization in accordance with that vision. Most importantly, you’ll understand what business you need to be in to become the dominant force in your market. A system of constant strategic innovations is the ultimate advantage. Apple. Facebook. Tom’s Shoes. What do all of these groundbreaking companies have in common? Learn the secrets behind their effective business maps and the rest of the 7 Forces of Business Mastery.